Graduate Dean Austin Cunningham, Dean Kratz, and the faculty of the School of Arts & Humanities wish to encourage graduate students in all 5 degree programs to present their creative or scholarly work at professional conferences, symposia, and workshops. To that end, we will award 6 to 8 travel grants of $350 in the Spring 2015 semester. Graduate Travel Grants take the form of reimbursement for travel expenses. Graduate students who have applied to participate or have been accepted to participate in a professional conference, symposium, or workshop held within the United States should submit the application below by the appropriate deadline. Spring 2015 deadline: 30 March 2015. The Graduate Studies Committee will make its decision giving priority to the following factors: academic record, seniority in graduate program, relation of presentation to final project (thesis, portfolio, dissertation), selectivity of conference, and degree of participation in conference. Due to limited funds, students may receive travel grants only twice in their graduate career. If you have any questions about the application process, feel free to contact Associate Dean Michael Wilson (mwilson@utdallas.edu). Today, January 27th at 5:30pm, the GSA will hold its first general meeting of the spring semester. The Meeting will be held at Fuzzy’s Taco Shop (561 West Campbell Road Richardson, TX 75080). Please join us for food and camaraderie. We will also discuss our upcoming Graduate Symposium: RAW 2015. Retired Admiral William McRaven, shown last year, took over as chancellor of the UT System on Jan. 5. Retired Admiral William McRaven, the former commander of U.S. Special Operations Command, has only been chancellor of the University of Texas System for four days, but he already has a lot on his plate. The legislative session opens in less than one week, a search is underway for a new president for the system’s flagship university and there are years’ worth of conflicts to resolve. When he accepted the job, McRaven, best known for leading the successful raid to kill Osama bin Laden, became one of the nation’s most highly paid higher education administrators. His $1.2 million annual salary comes with the potential for major bonuses. Legislators spent much of last year investigating, and ultimately censuring, one of the system’s governing board members — Regent Wallace Hall — for the way he was personally investigating the University of Texas at Austin’s administration, primarily President Bill Powers. Meanwhile, the system launched reviews of UT-Austin’s admissions policies, its relationship with foundations that provide the university financial support and its accounting practices, all of which were subjects of Hall’s scrutiny. Speaking with The Texas Tribune in his new downtown Austin office Thursday, McRaven, who officially took the reins from former Chancellor Francisco Cigarroa on Monday, addressed how he intends to get everybody moving forward in the same direction — and what that direction might be. He also discussed the search for the next UT-Austin president (it will not be Condoleezza Rice), his positions on certain issues that will come up during the session (he is against campus carry), and where he will make his first official campus visit (he will head down to what will soon be known as the University of Texas-Rio Grande Valley in South Texas). Texas Tribune: You’ve been chancellor for less than a week now. How is it going relative to your expectations? William McRaven: It’s actually been going very well. One of the things that I did before I decided to take the job was to look at the parallels between my last job and this job. It might surprise people that there were a lot of parallels between how I had to run 65,000 folks and $10.4 billion at the U.S. Special Operations Command and how we are organized here. For example, in my last military assignment, I had subordinate commanders. Much like the presidents of the universities, they have a lot of autonomy, but they had to report to a system sort of a thing. So you had to understand how to deal with their state’s rights, their ability to run their institutions, and yet, your requirement to provide oversight and guidance and those sorts of things. My No. 1 focus in my last position was on the welfare of the troops. At the end of the day, it’s all about the troops in the military. Here, to me, it’s all about the students. You have to make sure the students have the right student experience that when they come out of the institution, they’ve got a job and they’re going to be really good at what they do. If you take your eye off the ball, if you think it’s about something else, then I think you’re missing the crux of, particularly, the higher ed piece. I had to work with Capitol Hill at my last job. I have to work with the Capitol here. I had retirees that were a constituency base. You have the Texas Exes here, and other constituencies. You have the board of regents here, but I had the Joint Chiefs of Staff. So, frankly, those parallels are proving to be pretty clear. TT: In the message you sent out on your first day, you talked about wanting to move forward from disputes and disagreements that have been ongoing for years. But many of the key players in those disputes are still around and don’t appear to be changing course, so how can you move forward? McRaven: It’s about establishing trust. My job really is to be the CEO of the UT System. I have to be able to have trust between the board of regents and myself. They’ve got to trust me to do the job. And then, frankly, I’ve got to build the trust between the presidents of the institutions and myself. And it starts with me. I believe it is all about making sure I am trustworthy. The way you do that is all about building personal relationships. You have to meet people. They have to know that you have a wife and kids and what your desires are, what your goals are. Because if you have no personal relationship with these people, then when the times get tough, it’s really hard to trust them. There are going to be some hard decisions that have to be made. But if you make the hard decisions and people trust you because you have that personal relationship, it’s going to make the outcome all that much easier. So, job one is to build trust, which is what I intend to do. I think if you do that, we’ll get past these. We have to resolve these. I’m not saying the disputes are wrong. I’m just saying we have to resolve them and move on. TT: Will trust be hard to build knowing that it is not unheard of for members of this board to secretly record the chancellor in closed-door meetings? McRaven: I don’t know about that specific incident. But what I can tell you is that you have to build the relationship. And frankly, everything I say, I’m going to say it from a position of trust. Frankly, nothing I say should be off the record in terms of where my positions are, and people will know that. Transparency is a big piece of this as well. TT: Speaking of positions on things, we have a legislative session coming up. Have you thought about your positions on issues that are likely to come up, such as campus carry? 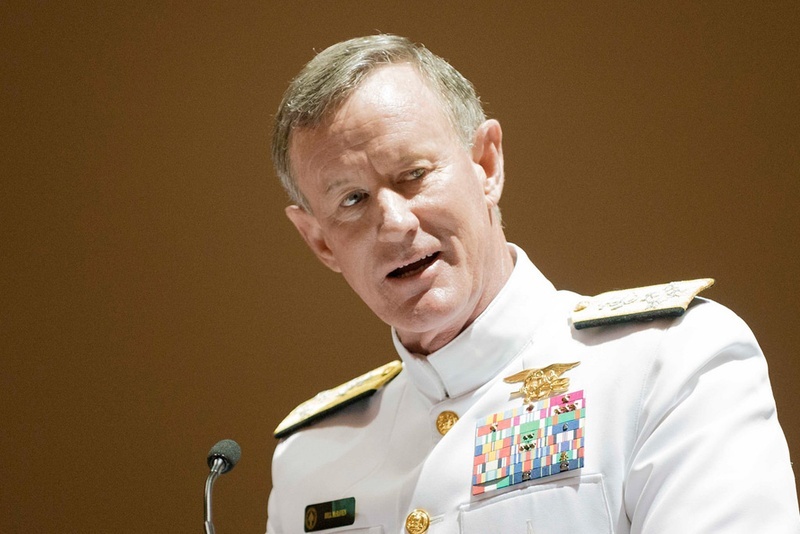 McRaven: My position is just like Chancellor Cigarroa’s was. I do not support concealed weapons on campus, because I think the first priority really is the safety of the students. It concerns me that we would have somebody on campus who may have a legitimate right to carry a concealed weapon, but that doesn’t make the security any easier when you do that. I will reinforce that officially when I have the opportunity, but right now my position is consistent with what Chancellor Cigarroa’s was. TT: What about the state’s policy of letting undocumented students who have lived in Texas for a certain amount of time pay in-state tuition rates? McRaven: I’m taking a hard look on that. I got a pretty good briefing on it, but I’ve gone back to the staff and said I need some more information before I’m prepared to have a position on it. I may not have a lot of time to develop that position in light of the session coming up, but I have to take a harder look at that. McRaven: It’s not going to be Condi Rice, I can tell you that. TT: What are you looking for in the next president of the flagship? McRaven: What I’ll tell you is that I’ve been really pleased with the process. Obviously, this is my first opportunity to serve on a search committee. But the members of the search committee, the search firm we got, the process that’s ongoing is everything the people of Texas would hope it would be. We’ve had great interviews with candidates. We’ve got more interviews to go. All the candidates that have come forward have met the criteria of what we’re looking for. You have to have somebody who is a leader. You have to have somebody that has great academic qualifications. You have to have somebody that is going to gain the trust and respect of the faculty and the students. And frankly, everybody we’ve looked at meets that. So we’re in a position where we have great candidates, and I know the committee will come to a pretty good decision. We’ll have a limited number that we’ll forward up to the board, but I think all of those will be great candidates. TT: There have been some concerns raised by the people that manage the system’s endowment the rate at which it is being spent by the board of regents. Especially with oil prices dropping, are you at all worried about the flow of revenue going forward? McRaven: I think you always have to make sure you are a good steward of the taxpayers’ money. Whether we are flush with money or whether we are in tight times, you always have to be good stewards of the money. So I don’t think our approach will be much different. I think what will happen is, with less money, we might be able to do less. But the things we do, we will still do as well as we can. I think this is really just a function of making sure we do right with the money we get. TT: For the last few years, much of the focus of conversations about higher education in the state has focused on the governance of one institution. How would you like the conversation to change going forward? McRaven: Well, make no mistake about it — when we look at UT-Austin, it is the flagship institution. It will continue to be that, and we will continue to make it the very best we can make it. But there are a couple things we need to do in terms of higher ed. We can talk about affordability and access, and we can talk about graduation rates, and we can talk about things that are mechanical. But I honestly think we need to change the culture and be a little more fundamental in our approach. I’ve said this in my external communications. This is about students that want to come into the classroom and be excited about what they’re teaching. I threw down the gauntlet a little bit to the professors and said: you ought to come to work every day a little anxious. And by that I mean, a little excited — fired up that I have the opportunity as a professor to change the lives of the young men and women sitting in my classroom. That’s a privilege. That ought to be an honor to them to be able to do that. We’ve got to give them the latitude to do that. We have to have them, and encourage them, to challenge conventional wisdom. I do want them to push the envelope. I want the students to push the envelope. If you start with a change in the culture, recognizing that this is about academic freedom, intellectual freedom, that’s what the foundation of great universities are. If we encourage that, then I think we can work the mechanical issues. We can figure out the process piece of this. But if you don’t change the culture, I’m not sure all the processes in the world are going to make you a better university. Don’t misunderstand me. I think the preponderance of professors come in every day, and they do come in to change the world. They do come in to be the best professors they can be. But it can’t be the preponderance. It has got to be everybody. And it’s not just the students and the faculty. It’s got to be the administrators and the staff. I think we sometimes undervalue the work of the staff. These are the folks that have as much loyalty to the individual university as any other segment of the university. They are kind of the unsung heroes of what happens at the universities. So we’ve got to change this culture, and we are going to set out to do that. TT: Do you have any particular concerns coming into the position? Or conversely, is there anything you are particularly looking forward to? McRaven: One of the reasons I took the job was because I saw what we were trying to do down in the Rio Grande Valley. In fact, it’s going to be my first campus visit. I’m excited about it. I was raised in San Antonio, and I have great fondness for the people of South Texas. I think UT-RGV can fundamentally change the cultural capital down in South Texas. If we do it right, and we will, we’re going to take this predominantly Hispanic and Latino culture down there and make them the center of what happens in South Texas through the UT System. That’s vastly important. It’s one of the primary reasons I took the job. That excites me. I wasn’t worried about anything about the job. I saw tremendous opportunities. I think the Dell Medical Center is going to fundamentally change UT-Austin and, frankly, the state and potentially the nation and the world. It’s the first medical center that’s been established at a top-tier university in a very, very long time. What a great legacy for Chancellor Cigarroa, the board of regents and UT-Austin — and for Michael Dell. So it’s the opportunities that are out there. It gets back to the students and the people of Texas. If you can change the lives of the people of Texas for the better, that’s a pretty good job.